﻿ How to Solve "can't add music to iTunes (iTunes 11 included)" Issue? Home » audio » How to Solve "can't add music to iTunes" Problem? How to Solve "can't add music to iTunes" Problem? As we know, iTunes is not only a media player for playing music and movies, iTunes is also a media library application which helps to download, save, and organize digital audio and video and helps to transfer media files from computer to iPod, iPhone, iPad and Apple TV. Situation 2: Can't add iTunes unsupported music formats to iTunes. In fact this is a normal phenomenon. But how wonderful if we can import those kind of music like FLAC, OGG, WMA, CAF, MP2, SHN, QCP, MPC, PCM, APE, AMR, AWB, AC3, AUD, RA and etc to iTunes! Situation 4: Though we have successfully imported music to iTunes, iTunes failed to play them or failed to sync them to iOS devices like iPod, iPhone, iPad. How to Solve "can't import music to iTunes" Problem? We will no longer have to worry "iTunes won't add music" issue as soon as we get Bigasoft Audio Converter! Bigasoft Audio Converter can convert all kinds of music to iTunes compatible format for fast import to iTunes (including the new iTunes 11). It supports converting lossless music formats including FLAC, Monkey's Audio (.ape), WavPack (.wv), TTA, ATRAC Advanced Lossless, WAV, AIFF, AU, raw header-less PCM, M4A, Windows Media Audio Lossless and Shorten (SHN) to iTunes supported lossless audio format like AIFF or Apple Lossless M4A. It also supports converting the above lossless music format to iTunes supported lossy audio format like MP3. It can convert lossy music like MP3, Vorbis OGG, WMA, Musepack MPC, AAC, ATRAC and CAF, QCP, AMR, AWR, MP3, RA to iTunes supported lossless or lossy audio format like AIFF or Apple Lossless M4A. It even can convert music video in AVI, MP4, MOV, WMV, MKV, VOB, FLV, 3GP and etc to iTunes supported audio format. The following is a step by step guide on how to import music to iTunes with the help of Bigasoft Audio Converter. 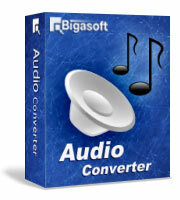 Free download - Bigasoft Audio Converter (Windows Version, Mac Version), install and run it. Click the "Add File" button to import the music file which can't be added to iTunes. Or you can also drag and drop your music file directly to the main interface of Bigasoft Audio Converter. Click the "Profile" drop-down button to select iTunes compatible music format like "ALAC - Apple Lossless Audio Codec(*.m4a)" or "MP3 - MPEG Layer-3 Audio(*.mp3)" as output profile from "General Audio" category. 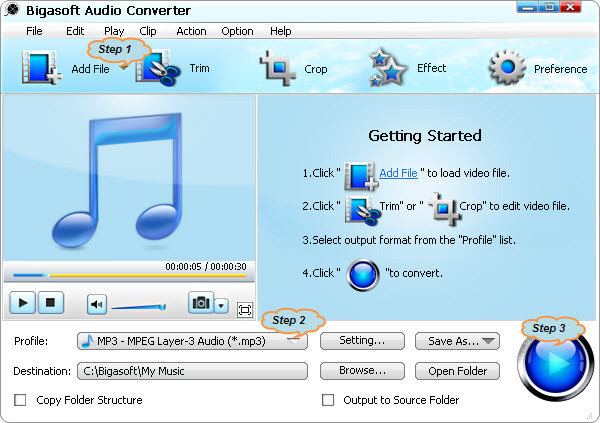 Click the "Convert" button to start converting the music file to iTunes supported audio format. It will be finished with high output audio quality and fast converting speed. Start iTunes, you can directly drag and drop the converted music to the appropriate icon on the left side of the iTunes window, or choose File > Add to Library (on Windows, choose Add File to Library) and then select the converted music you want to add to iTunes.